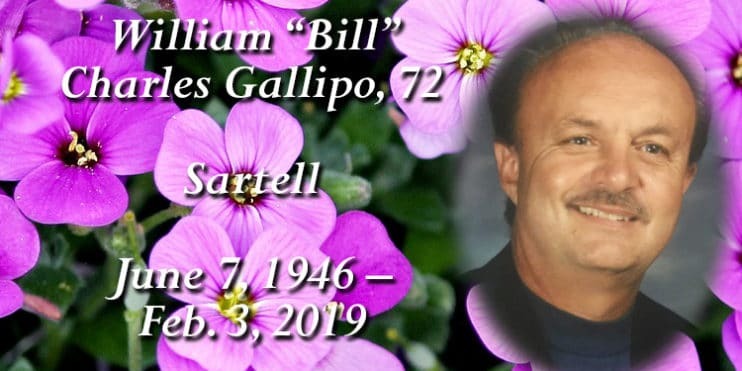 William “Bill” Charles Gallipo, 72, of Sartell, died Sunday, Feb. 3, at Edgewood Senior Living in Sartell. A gathering will be held from 4-8 p.m., with a 7 p.m. time for sharing Friday, Feb. 15 in the Daniel Funeral Home, St. Cloud. Gallipo taught and coached at Sartell High School during his career before retiring in 2004. Survivors include his wife of 50 years Sheri; children: Shanna (Brian) Oberg of Camas, Washington, Kyle of Washougal, Washington, and Brandon (Katie) of Sartell; four grandchildren: Brody Oberg, Mason Oberg, Ruby Gallipo and Dylan Gallipo; sisters: Alona (Alan) Moller and Tania Huston both of Camas. This obituary in its entirety will be printed in the Feb. 22 edition of the Sartell-St. Stephen Newsleader and will be posted online at thenewsleaders.com that same day.